The FMG80A Series magmeter is designed for low-flow chemical injection or difficult-to-meter applications with pulsating metering pumps in ¼ to ¾" pipe/tube. The housing is made of sturdy splashproof HDPE plastic. With no moving parts, the FMG80A Series can handle fluids containing particulate matter without clogging or jamming, keeping maintenance at a minimum. With no metallic parts (100% PVDF body and PVDF carbon fiber-filled electrodes), the meter is corrosion-resistant and compatible with a wide range of chemicals. Accuracy is maintained with conductive fluids (>20 micro Siemens) of varying viscosities and densities. 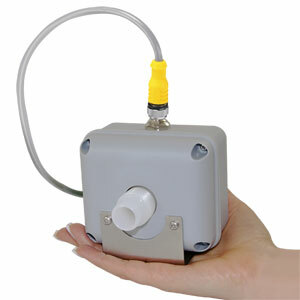 The FMG80A Series meter is compact enough to fit most pump/ injection systems. With zero straight pipe required after an elbow, it can be easily mounted in tight spaces. The mounting bracket adds stability. The FMG80A Series meter has opto-coupled current sinking or current sourcing pulse as well as a 4 to 20 mA output that can be connected to many OMEGA™ panel meters, controllers and data loggers; outputs and power are provided through a 6 m (19.7') cable with 8-pin female circular connector. Pipe Sizes: ¼, &frac38;, ½, and ¾"
Note: Comes complete with 6m (19.7') cable with 8-pin female circular connector and operator’s manual.